Have you ever been in a situation where you went to a meeting and you forgot to take a pen and book with you? Trust me, I have also been in that situation So I know what it feels like. Today’s article will basically tell you about Apps that you can actually install on your Android device that’ll enable you to take notes with your Android device. So, in this post, I will be listing some note taking apps for Android 2018. To start with, Evernote is a well-respected app that is well known for note taking. This sweet app can serve as a journal, organizer, planner or even a notebook. With this app, you are also opportune to share your ideas with people on social media. It is also capable of syncing your data on cloud storages. You can also make a checklist to make sure that your everyday life is well organized. Evernote is also nice for business because you get to keep records of business transactions too. You are able to access your files online and offline. If you are a student, worker or teacher. You should give this app a try. The second App on this list of best note taking apps for Android is OneNote. OneNote is an Android app that is developed by Microsoft. This app is securely hooked up to a cloud storage that allows you to backup your files online. It a very flexible note taking App for Android that allows you to type, draw, handwrite and insert things you find on the web. OneNote allows you to scan text written on paper and putting them in written form into the OneNote app. This baby also allows the sharing of virtual notebooks with your friends. The most interesting thing about the OneNote app is that it is completely free to use. Here is another special app for note-taking. Developed by Google, Google Keep offers you the ability to create as many notes and lists you wish to and the chance of capturing inspirations whenever and wherever it strikes. Ability to add a collaborator to your works. Access your notes on any device your Gmail account is logged on. It helps to dictate your thoughts and keep them in a recording. You can also make use of the OK GOOGLE to take notes. Google Keep app is a sure one and also a must try. SimpleNote is a lightweight note taking app for Android with a simple UI. It is one of the easiest ways to keep notes, lists, ideas and more. This app is capable of syncing all your files and make them accessible on all your devices. Simple Note is known for speed and efficiency. It also has a feature that helps you organize your files for easy location, with the aid of tags and pins. This baby is totally free to use. Clevnote being the fifth baby on the list is an outstanding note taking app for android that has lots of features. With this app, you will be able to manage your bank account numbers, in case you wish to copy it and send it to someone. This app also has a checklist that you can use to write down necessary items and use it for a shopping list. Clevnote also has a birthday reminder and probably all categories of reminders depending on what you want it to remind you about. You can also use it to keep records of site id, as it is difficult most times to remember them. It has other features like cloud backup, reminder function and lots of widgets. ColorNote is an awesome note taking app for android with lots of features. It is quite easy to use this app for creating and editing notes, memo, emails, and messages. It also has two types of text options which are very nice. You could also decide to change the background of the app to your taste. Color Note also supports backup support to cloud storage or phone storage and it supports calendar too. This app also has a password lock for those who wish to keep there stuffs a secret. With about 4.5 star rating on the Google play store, Fiinote is a very nice and convenient android app for note-taking. Capable to note everything, whether writings, video etc. It has a calendar, alarm, todo. It has other incredible features like Infinite canvas, text box, DIY templates, real pen style. 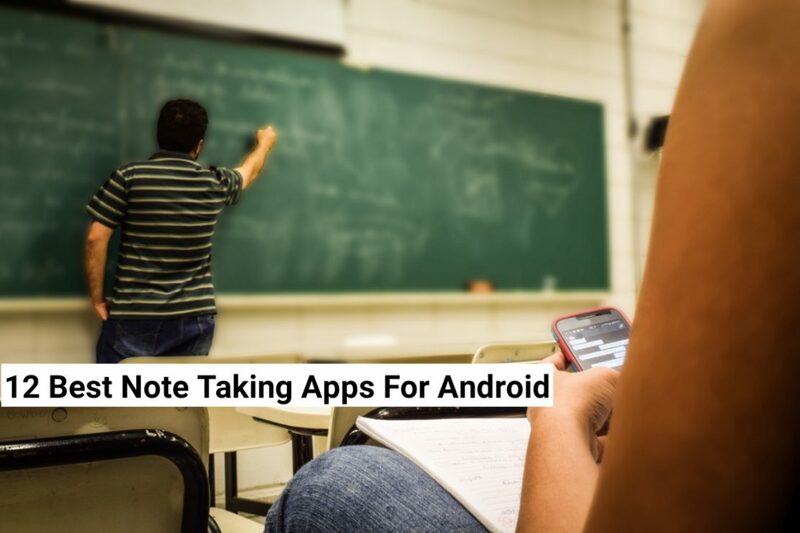 You can not get to talk about best android apps for note taking without mentioning FairNote. This app is an easy notepad that keeps all your notes organized and secured. You can use this app to write to any length of your choice. It has the ability of grouping apps with different labels and colors. Also has the ability too secure files with fingerprint authentication, Which is very cool. This app has a free and premium version but the free version gets to have lots of features while the premium version removes ads, adds a dark theme, and also adds more encryption features. Lecture notes being the 9th app on our list is a very super app for students especially college students. This app supports the use of stylus pen to write, draw and so on. The bad news about this app is that it is a free trial app but when it gets paid for, Trust me you will love everything about this baby. A cool Note taking App indeed. Omni Note is an open source and lightweight notepad for Android. It has a very nice material design and also displays all your notes in a card layout. Literally, this app can also be used to draw doodles and it has a widget which can be used to access the app very quickly. This app is very smart and very nice for note-taking. Somnote is a beautifully designed app for note-taking on Android. This app was designed especially for those who love to keep their journal and writing a secret. It has a search mode which helps you locate all your files and journals with no stress. SomNote also has the ability to keep all your stuff private and synchronize your data on cloud storage or local storage. The free version of this app supports ads and a limited cloud storage space but once you get a premium plan you will be given a 30gb cloud storage space. The last app on our list is Notebook by name. Notebook has lots of features that make it outstanding. You can add logos, audio, and drawings. You can also get to scan documents and directly add them to your notebook app. This app is very good at organizing your note in a well-mannered way. Syncing across other devices and on cloud storage is also supported. The use of gestures is also allowed and that makes it easier to use it. You can also customize the color of your text to your own taste and also change the background image of the app if you wish to. We have finally come to the end of this long article on 12 BEST NOTE TAKING APPS FOR ANDROID. Personally, I think it’s way cooler to write notes on your Android device than write on a notebook. Yes! There are disadvantages that come with using your Android device as a note-taking device, but there are also advantages too. Thanks for reading! Do you have a personal favorite Note taking App for Android? We’d love to know about it.